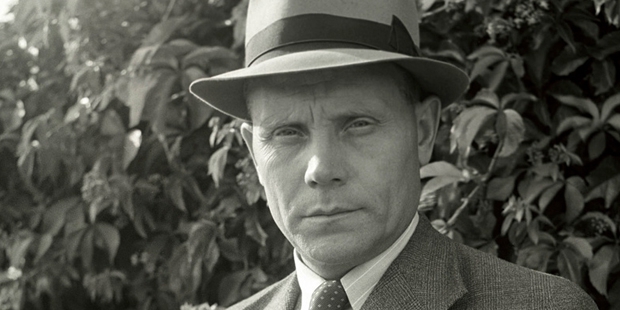 Paavo Nurmi was born on June 13, 1897 at Turku, Finland. He always liked running with his friends, mostly for long distances. By the age of 11, he was able to run the 1500 m in 5:02 mins. He had to leave school at the age of 12 to work in order to support his family. His first job was being an errand boy in a local bakery. His next job was pushing carts up the steep slopes in Turku. Although he stopped running, but regularly pushing weights helped him strengthen his back and leg muscles. He was inspired by Finnish runner Hannes Kolehmainen, and joined the sports club Turun Urheiluliitto as a pass time. His ambition was to run at the Olympics but till then he earned money for his family by working at the Ahlberg & Co. Workshop in his neighborhood. Next he joined the Finnish Army where he got appreciation for his abilities. With more time for his training, Nurmi started setting faster times with each new day. In May 1920, he set a national record in the 3,000m. In July, he also went on to win the Olympic Trials in 1,500m and 5,000m. 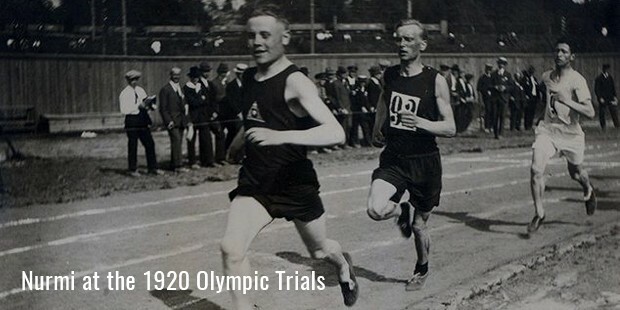 The 1920 Olympics at Antwerp, Belgium was the first big event in Nurmi’s career. In his first event, the 5,000m he came second behind Joseph Guillemot. This was a great achievement for Nurmi, winning a medal in his first Olympics itself. But Nurmi was not finished yet, he went on to win the 10,000m, cross country race, cross country team event. He ended up by winning three Golds and one Silver at his first major event, that too the Olympics. Paavo Nurmi was now a well known name in the sporting circles. This victory brought electricity and water to his family in Turku. But Nurmi was only starting to show his full potential. He went on to set his first World record in 1921 in the 10,000m. Next year he broke the World Record for the 2,000m, 3,000m and the 5,000m distance. In the process of training for the next Olympics, he set World Records in the Mile and 1,500m distances. 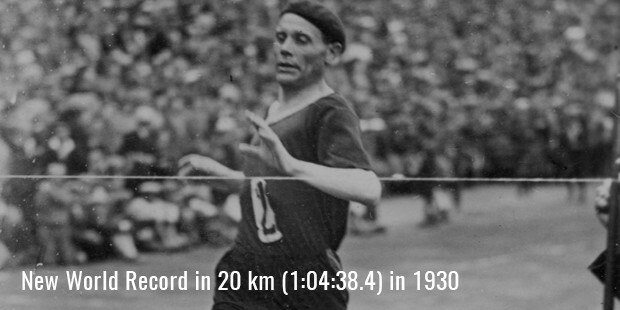 For the 1924 Paris Olympics, Paavo Nurmi was the firm favorite to win at least three medals. But Nurmi went on to exceed expectations to win a record 5 Gold medals. His first event was the 1,500m in which he went on to beat the Olympic record by three seconds. He also won the 3,000m, 5,000m, individual cross country and team cross country events. Nurmi had established himself as one of the greatest Olympians of all time with this performance. But Nurmi was disappointed that he could not participate in his favorite 10,000m race which he was sure to win. After the Olympics he went on to hold the 1,500m, the mile, the 10,000m, the 5,000m and the 3,000m simultaneously. 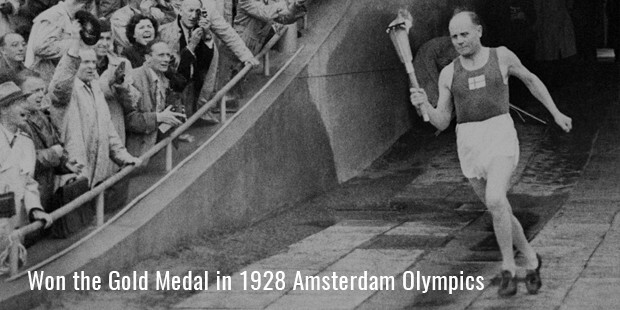 At the 1928 Amsterdam Olympics, Nurmi participated in only three events. He won the Gold in the 10,000m and the Silver in the 5,000m and 3,000 Steeplechase. Over his illustrations career he set 22 official world records. In his peak years he was undefeated for a stretch of 121 races in the 800m and upward distances. In his 15 year career, he never lost in the 10,000m or cross country events. He is without doubt the most successful distance runner of the 20th century. 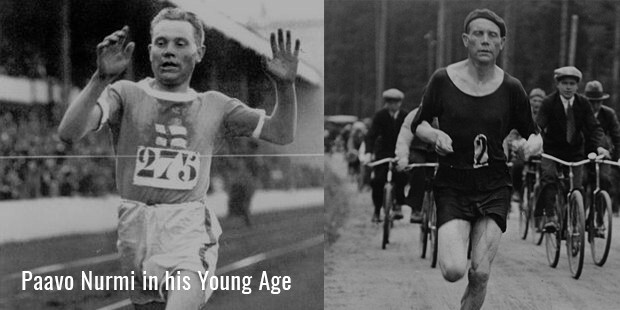 From being a hard working employee, Paavo Nurmi has gone on to become one of the most admired sportsmen in history.